Gender-based differences in the physiological response to exercise have been studied extensively for the last four decades, and yet the study of post-exercise, gender-specific recovery has only been developing in more recent years. 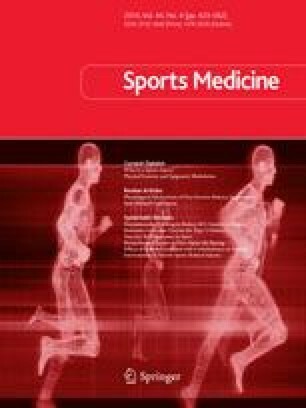 This review of the literature aims to present the current state of knowledge in this field, focusing on some of the most pertinent aspects of physiological recovery in female athletes and how metabolic, thermoregulatory, or inflammation and repair processes may differ from those observed in male athletes. Scientific investigations on the effect of gender on substrate utilization during exercise have yielded conflicting results. Factors contributing to the lack of agreement between studies include differences in subject dietary or training status, exercise intensity or duration, as well as the variations in ovarian hormone concentrations between different menstrual cycle phases in female subjects, as all are known to affect substrate metabolism during submaximal exercise. If greater fatty acid mobilization occurs in females during prolonged exercise compared with males, the inverse is observed during the recovery phase. This could explain why, despite mobilizing lipids to a greater extent than males during exercise, females lose less fat mass than their male counterparts over the course of a physical training programme. Where nutritional strategies are concerned, no difference appears between males and females in their capacity to replenish glycogen stores; optimal timing for carbohydrate intake does not differ between genders, and athletes must consume carbohydrates as soon as possible after exercise in order to maximize glycogen store repletion. While lipid intake should be limited in the immediate post-exercise period in order to favour carbohydrate and protein intake, in the scope of the athlete’s general diet, lipid intake should be maintained at an adequate level (30%). This is particularly important for females specializing in long-duration events. With protein balance, it has been shown that a negative nitrogen balance is more often observed in female athletes than in male athletes. It is therefore especially important to ensure that this remains the case during periods of caloric restriction, especially when working with female athletes showing a tendency to limit their caloric intake on a daily basis. In the post-exercise period, females display lower thermolytic capacities than males. Therefore, the use of cooling recovery methods following exercise, such as cold water immersion or the use of a cooling vest, appear particularly beneficial for female athletes. In addition, a greater decrease in arterial blood pressure is observed after exercise in females than in males. Given that the return to homeostasis after a brief intense exercise appears linked to maintaining good venous return, it is conceivable that female athletes would find a greater advantage to active recovery modes than males. This article reviews some of the major gender differences in the metabolic, inflammatory and thermoregulatory response to exercise and its subsequent recovery. Particular attention is given to the identification of which recovery strategies may be the most pertinent to the design of training programmes for athletic females, in order to optimize the physiological adaptations sought for improving performance and maintaining health. No sources of funding were used to assist in the preparation of this review. The authors have no conflicts of interest that are directly relevant to the content of this review. The authors would like to thank Karine Schaal (IRMES) for her English editing assistance and the relevant advice she brought to this review.